The most successful feature of a pay entertainment given on March 17th was a chorus of “Irish Colleens,” who sang Irish ballads, to the great enjoyment of the audience. The colleens were twelve pretty girls wearing homespun frocks and wreaths of shamrock. They carried little shillalahs (blackthorn clubs) specially made for the purpose. At different points of the songs tiny lights appeared simultaneously in the shillalahs, suggesting Willo’-the-wisp. Green light was thrown on the colleens as “The Wearing o’ the Green” and other patriotic songs were rendered. Irish Stew, with Green Peas. Sauterne Jelly, colored green, or Pistache Cream. Green Tea and Creme de Menthe. For simpler refreshments there might be cress or lettuce sandwiches, potato salad or cold boiled salmon with sauce tartare, pistache cream with small iced cakes cut in fancy shapes, olives, crystallized mint leaves and coffee. A clever idea last year at a dinner was the passing of small clay pipes with the coffee, their bowls stuffed with cotton soaked in alcohol. When these were lighted they not only produced a pretty effect, but were used to set on fire the cubes of sugar in each cup of coffee. In case you elect to make your pistache cream at home, let me give you a reliable recipe. Serve the cream in meringue shells, which may be purchased of the confectioner. The green cream pressed between the white shells looks most attractive. In sending out your invitations for a St. Patrick’s Day entertainment ask the guests to honor the saint, the day and the nation by their dress. These costumes need not be elaborate. Green ties for the men, big green-covered buttons—if they so elect—for their waistcoats, and, of course, a sprig of shamrock for the “buttonhole. 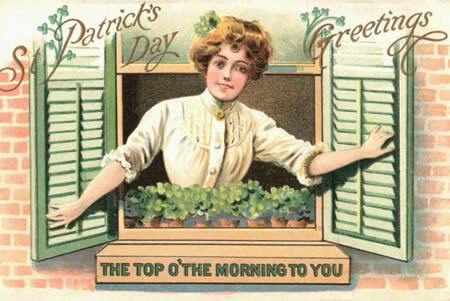 The women may wear wreaths of shamrocks, real or artificial, in their hair and corsages. In decorating the house for such an event, green should predominate. String paper shamrock leaves on green cord carried from the corners of the table to the chandelier above the centerpiece. Glass candlesticks, with green shades, or green electric light bulbs could be used. A large cardboard harp, gilded and placed in a conspicuous position, labeling it, “The Harp that Once through Tara’s Hall,” is another suggestion. During the evening let some member of the company standing by the harp read or sing the poem. Let Irish guests sing Irish melodies and invite all present to repeat some Irish bull, giving a prize for the best. A clever idea for a St. Patrick’s entertainment is a big Jack Horner pie that can be purchased ready made or constructed at home from a big round hat-box. It should be covered with moss or green paper and filled with St. Patrick favors, each wrapped in green tissue paper and attached to emerald ribbons used to draw them from the box. For card parties tally cards in white and green, with shamrock wafers, should be used, while Japanese napkins, doilies and even tablecloths in sets, decorated with the shamrock, may be secured to carry out the color scheme. Green paper salad and ice cases in the St. Patrick motif would be an appropriate finish. If one does not care to purchase paper cases for the salads it is easy to make them at home from vegetables. For instance, green peppers make attractive cups for salads. To prepare them, cut a thin slice from the top and remove the seeds and white pulp. If they do not stand, cut a slice from the bottom also. This can be a little roast pig on a bed of cress, a clay pipe in his mouth, his tail tied with green ribbons and a garland of green round his neck. If one does not care to have a whole pig, a ham, pork chops, or an Irish stew with potatoes and peas would be a tasty substitute. The salad may be a potato salad or a Ballyshannon pickle, which is simply salmon served with dill pickles. Other suitable dishes are sauterne jelly colored green, Irish moss salad, pistache cream in meringue shells, olive sandwiches, cakes with green icing and decorated with citron shamrock leaves, green and white mints and lime drops, salted pistache nuts, green tea and creme de menthe. While almost any salad may be used in carrying out the green color scheme, the dressing in most cases is most appropriately a sauce tartare, which is a mayonnaise or cooked dressing made acid and green with chopped pickles, capers, nasturtium seeds, parsley or olives. A cooked dressing, also acid, is used for broiled fish and goes by the same name. To make the cold sauce tartare, put into a cold bowl a half-teaspoonful each sugar and mustard, a saltspoonful salt and one-half saltspoonful of pepper. Squeeze in two or three drops of onion juice, add the yolks of two raw eggs and stir well. Then commence adding, at first very slowly, a cupful of olive oil. At first the oil should go in almost drop by drop, but as soon as the mayonnaise begins to thicken it may be added in larger quantities. When all the oil has been used add a tablespoonful lemon juice and a teaspoonful tarragon vinegar and beat again. Mince fine enough parsley to make a tablespoonful and rub with the back of a spoon to a paste, adding during the rubbing two or three drops of alcohol (not the wood alcohol). Stir this paste into the mayonnaise together with two tablespoonfuls of chopped pickles and olives. Stir well together. This may be used at once or can be prepared ahead so as to simplify the work of getting ready on St. Patrick’s Day. Boil six large potatoes with their jackets and let them cool in their skins. Then peel, slice and chill. Chop very fine a heaping tablespoonful of parsley and half an onion, mix lightly, cover with sauce tartare and serve on lettuce leaves. Soak two tablespoonfuls granulated gelatine in a half cupful of cold water for twenty minutes. Pour over the softened gelatine one and one-half cups boiling water and stir until completely dissolved. Add one tablespoonful lemon juice and a cup of granulated sugar. Color with spinach juice or leaf green, strain, pour into a shallow pan and chill. Serve in green apple cups, in glass sherbet cups or paper salad cases. A plain lemon jelly tinted green is also appropriate to the day, particularly if a bunch of real shamrock leaves is molded in it. Beat to a cream one cupful butter, then add, little by little, two cupfuls granulated sugar and cream again. Add one-half cupful sweet milk, three and one-half cupfuls flour sifted with four teaspoonfuls baking powder. Lastly fold in the whites of seven eggs, beaten to a stiff froth, and enough green coloring matter to make a delicate green. Flavor with almond extract and bake in layers. When cool, put together with a filling of boiled icing mixed with chopped raisins, currants and nut meats. Cover with icing tinted green, tracing a shamrock vine about it with white icing, using for this purpose a confectioner’s tube, or a cornucopia made from stiff white paper. Put an Irish flag in the center, and about it a circle of green candy pipes, bowls upward. Sprinkle with candy shamrocks. Cream of Murphy soup is people!